Good ventilation is a must to preserve the life of your roof, both shingle and metal. Without good ventilation heat and humidity build up and create moisture that can cause a multitude of issues. Problems that can arise; wavy looking roof, leaks, rotting and mold on interior side of roof decking, and shingles to fail and curl. There are two parts to ventilation and both parts are equally important, intake and exhaust. Intake is brought typically into the home from the eaves at the soffits, but additional intake can be introduced with edge vents that we would install on the roof to increase that intake air. The exhaust of the roof has many option, but the preferred method is a ridge vents. This method is best to take advantage of “hot air rises” theory, and provides more curb appeal than multiple protrusions in the roof. 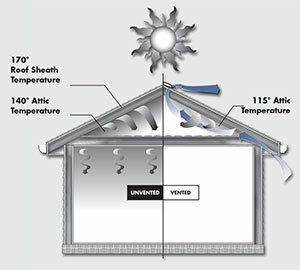 In the event there is not enough ridge to properly ventilate the roof other options are available such as; gable vents, power vents (needs 110v power supply), static or pod vents.